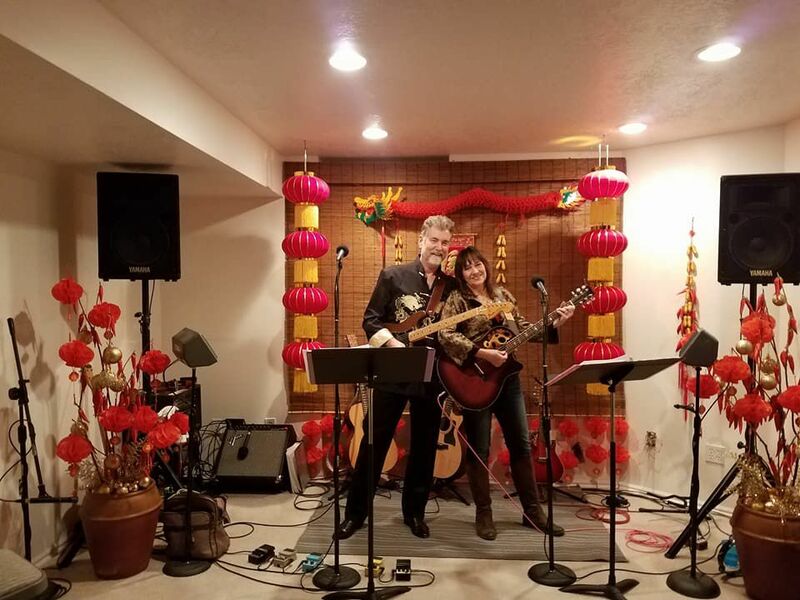 In what has become a holiday tradition, the musical duo of Alan and Valerie Brown are performing on New Year’s Eve at The Blu Pig. The husband and wife team moved to Moab in 1992, when they began performing regularly for the Bar-M Chuckwagon live Western show and cowboy dinner, which they owned for 20 years. They sold the dinner show a few years ago, and now perform songs from various musical genres at venues around Utah. Prior to moving to Moab, they were both pursuing musical careers in Nashville. In Nashville, Valerie was a member of a musical and comedy recording trio called Ethel and the Shameless Hussies. The couple continues to sing and play cowboy music — including yodeling — across a variety of rock and roll oldies, country and folk. Alan plays both electric and acoustic guitar, as well as banjo and harmonica. Valerie plays acoustic guitar and the mandolin. Both sing harmony together. The audience can also expect to hear Johnny Cash tunes, and perhaps some Led Zeppelin or Neil Young. They may perform a little bluegrass music. Alan additionally performs with a country music band in Moab called Bubba and the Red Rock Outlaws. There’s no cover to hear the duo perform at the Blu Pig — just be sure to order drinks or food. The Blu Pig co-owner Jake Tanner said the restaurant’s lounge will be offering a New Year’s Eve dinner special that evening. This year will mark the third anniversary of the Browns’ performing a New Year’s Eve show at The Blu Pig. They often perform a Valentine’s Day show at the restaurant. “The Blu Pig is a good venue for us,” Alan said. The couple occasionally performs in Salt Lake City, and for private parties and special events. The upcoming gig at The Blu Pig is especially sweet for Valerie, who has more to celebrate in the new year. She said she recently completed chemotherapy treatments after being diagnosed with cancer in July. “I’m especially excited to be back playing,” she said. Where: The Blu Pig, 811 S. Main St. When: New Year’s Eve, Dec. 31, from 6:30 to 9:30 p.m.